PHILADELPHIA (WPVI) -- With Temple University in a nationally televised game Saturday night on ABC, Philadelphia was able to showcase its sites - like the Liberty Bell, its sounds - like cheering Owls fans, and its...screams? It was Halloween night after all and ESPN commentator Chris Fowler was not going to let the opportunity to scare his broadcast partner Kirk Herbstreit pass him by. As the third quarter was set to begin, it appeared to be an ordinary conversation between the commentators before football resumed, but as Herbstreit began to speak he was met by two ghouls from Eastern State Penitentiary. Herbstreit was so shocked by the 'Terror Behind the Walls' ghastly visitors, he screamed and fled off camera. Fowler mentioned the two creatures were his friends after he had visited the haunted prison the night before. According to Fowler's Instagram, Herbstreit had 'wimped out' on joining him. "Imprisoned tonight in haunted infirmary @easternstate Penitentiary. Good Halloween Eve thrills! @kirkherbstreit wimped out!!" the Instagram read. "I'm glad I didn't go last night," Herbstreit joked. Still laughing about our halftime fright fest w/ @KirkHerbstreit --who was a great sport! Oscar worthy stuff from our two ghouls. 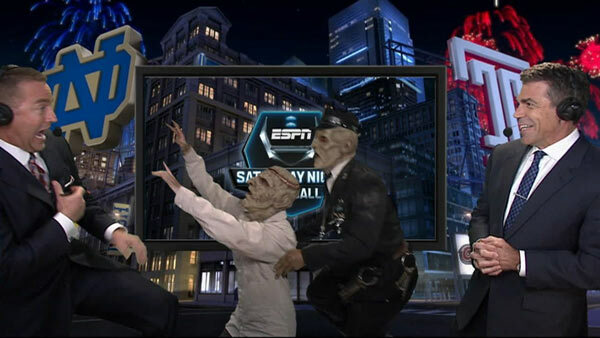 Responding on social media, Herbstreit wrote, "Mannnnnn, I DO NOT like haunted houses or crazy lookin zombies!" Herbsreit can also be seen on ESPN's College GameDay, which took place Saturday morning on Independence Mall as part of the countdown to the Temple-Notre Dame game.